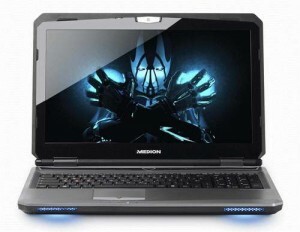 Medion Erazer X6811 is a latest gaming laptop which is designed for the game lovers.This device permits the game fans to play the games of their choice on the go with the mean of Wi-Fi connection. It has launched in Europe and surely you will be able to get it before the start of Holiday seasons therefore you are free to enjoy your holiday in the real manner. The price of this laptop is 854 Euros (about $1,159 US). Medion Erazer X6811 laptop powered by a faster 1.73GHz Intel Core i7-740QM processor. Exterior of this laptop is made up of a brushed aluminium and on the lid you will also see a finely engrave word “Erazer” It comes with a 15.6 inch display which boosts up the resolution of 1920 x 1080 pixels. This screen is large enough so a game lover will always enjoy a lot while playing on it . Real life graphics are on hand with the mean of Nvidia Geforce GTX 460M dedicated graphics card with 1.5GB GDDR5. Otheer specs of this Notebook are 6GB of DDR3 memory, and a 500GB hard drive along with secondary storage, 128GB SSD. It is preinstalled with Windows 7 home Premium operating system. Medion Erazer X6811 gaming laptop provides same connectivity options which are available with other advanced laptops such as 802.11b/g/n WiFi, Bluetooth 2.1, USB 3.0, HDMI and VGA video outputs. The measured dimensions of this Notebook are 398 x 268 x 56 mm while the weight of this device is 3.5 kg. So do you want to buy one for you? Share with me.